There were once two brothers who lived with their father and mother in a tent-home. The name of one brother was Esau. Esau was a great hunter. He spent much time in the woods and the fields. The name of the other brother was Jacob. Jacob stayed at home with his father and mother. One day Jacob did something wrong. 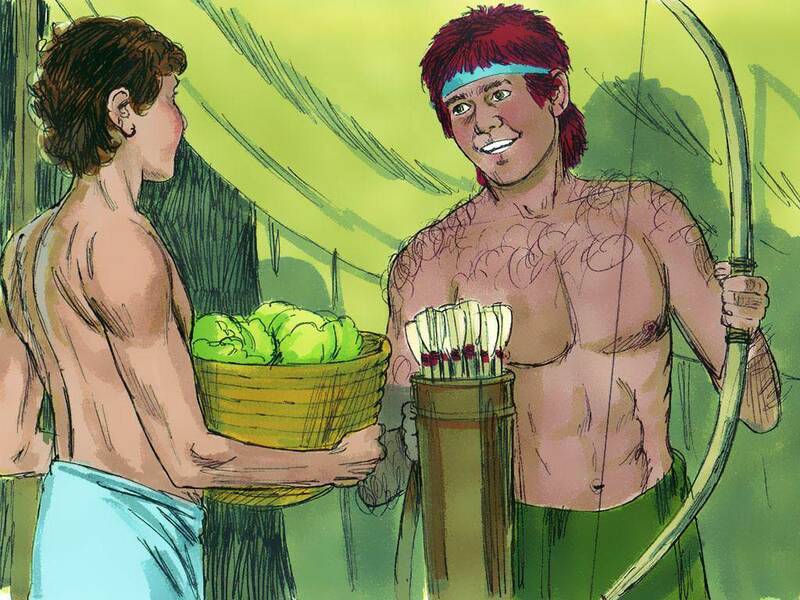 While Esau was hunting, Jacob took something that belonged to his brother. 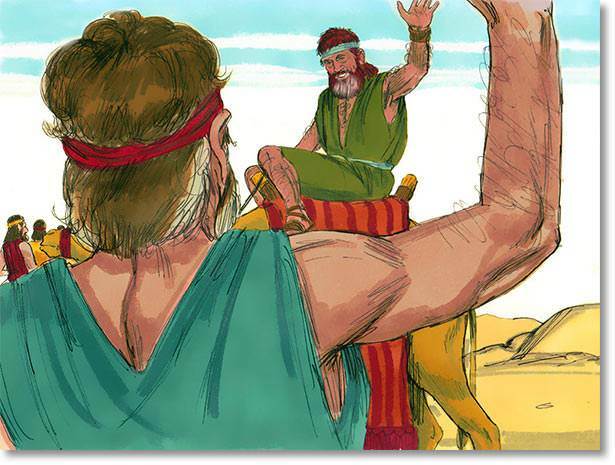 When Esau came home and learned what Jacob had done he was very angry. He said he would get even with Jacob. Then Jacob was afraid of his brother. He was so afraid that he ran away from home. He went away to another country where his Uncle Laban lived. 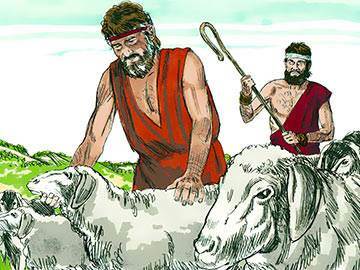 Jacob’s uncle gave him the work of looking after the sheep and cows. Year after year Jacob stayed in this country. He was afraid to go home. He married and had some children of his own. 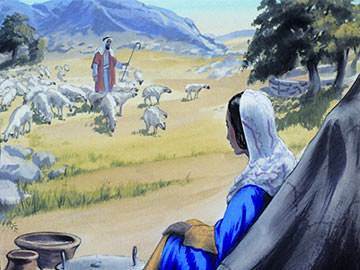 He had worked so hard that he had many sheep, cows and camels. But often he thought of his home far away. He thought of his father and his mother, and of his brother Esau. 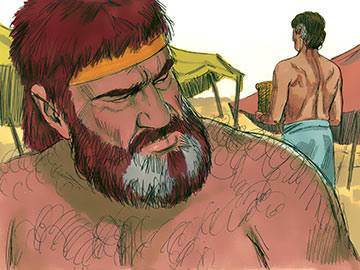 He wondered if Esau was still angry with him. Jacob was sorry that he had done wrong, but he had never told Esau that he was sorry. So Jacob started. Thud, thud, thud,went the feet of the camels and cows. Patter, patter, patter, went the feet of the sheep and the goats. The dust rose in clouds around them. Jacob was going home. But he was still afraid of his brother Esau. 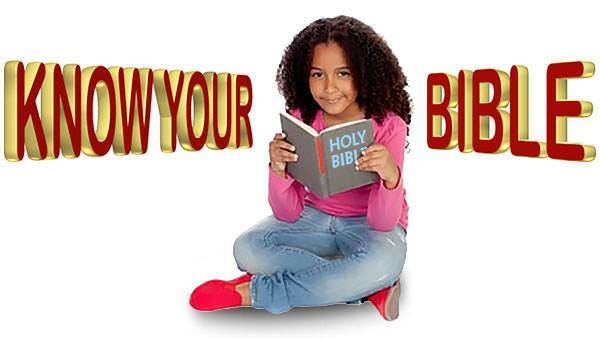 He decided to send Esau a present. Perhaps Esau would understand then that he was sorry. So Jacob called some of his servants. He sent them on ahead with a very fine present for Esau. By and by Jacob looked and saw a great company of people coming. When they came closer Jacob saw at the head of the company his brother Esau. With him were four hundred men. But Jacob went bravely out to meet his brother. 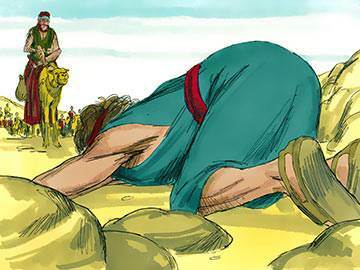 He knelt on the ground and bowed low before Esau. He wondered if Esau would be very angry. But Esau, when he saw his brother, came running to meet him. He put his arms around Jacob and kissed him. He had forgiven him long ago. 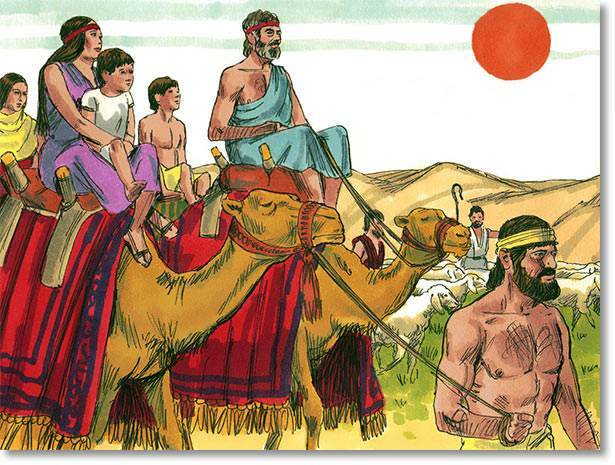 “What do you mean by sending me such a fine present?” asked Esau as they talked together. “I wanted to please you,” said Jacob. But Jacob begged Esau to keep his present. “If you do I will know that you are not angry with me any longer,” said Jacob. So Esau accepted Jacob's gift. 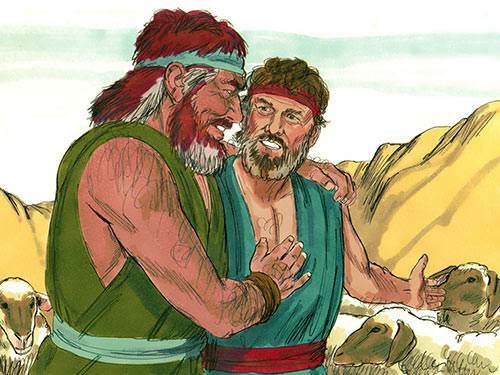 Esau offered to leave some of his men to help Jacob. Then the two brothers parted the best of friends. They were both happy because their quarrel was ended.